Lake Van Express sets off from the central Anatolian city of Ankara and heads to Bitlis's Tatvan district in eastern Anatolia. Setting off from the capital Ankara for Bitlis's Tatvan district, Lake Van Express is now the most popular overnight train line in Turkey with summer coming. In the last 15 months, the Lake Van Express has carried over 42,000 passengers. The overnight trains have gained popularity with the Eastern Express traveling between central Anatolian Ankara and the eastern city of Kars, which is famous for its history and natural beauty. Although the train takes more than 24 hours to reach its destination, the Eastern Express has became one of the places-to-be on social media. As the snow melts and nature awakens once again, the route of Lake Van Express mesmerizes is its passengers. 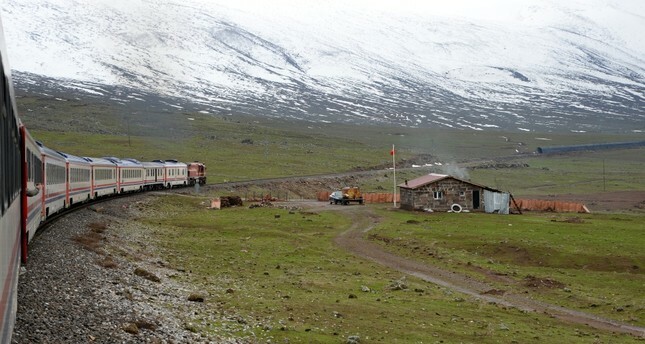 Traveling through Kırıkkale, Kayseri, Sivas, Malatya, Elazığ, Bingöl and Muş, the train arrives at Tatvan, located on the shore of Lake Van. Just like the Eastern Express, Lake Van Express owes its popularity partly to social media. Mehmet Karaca, a university student in Kahrmanmaraş, said he decided to book a ticket on the train after watching the videos other passengers shared on social media. Speaking to Anadolu Agency (AA) in the beginning of the journey, Karaca said he and his friends plan to make the most of the train ride and enjoy the natural and historical beauty of Bitlis once the train arrives at its destination. "The nature and the view from the train are incredible. I highly recommend everyone experience this. We are heading for Ttavan and plan to take the bus to Midyat in Mardin. We will be touring eastern and southeastern Anatolia. The train helped us see these beautiful lands just in 24 hours," Karaca added. İrem Şevik, also a university student, was just one of the passengers mesmerized by the splendid scenery. Şevik, however, researched the route before the train departed. "We woke up early in the morning to enjoy the view. It is enchanting. The train is very comfortable. We woke up, got our cups of tea in the restaurant and are now enjoying the scenery. We will stay in Tatvan but plan to take a quick trip to Van as well. I was extremely happy to book a ticket for this train. I am already planning a second trip in the summer with my friends," Şevik said. "We are planning to travel to Van and then Kars after we arrive at the final stop," said Ferhat Kalkan, who is also traveling with his friends. "We woke up at 5:30 a.m. just to witness the natural wonders. We are in love. We will return to Ankara on the Eastern Express and make the most of these lands. "Lake Van Express features eight cars and has a capacity of 320 passengers. The train carries passengers between Ankara and Tatvan two days a week and the journey takes about 24 hours.